“Light is the artist's sole medium of expression. He must mold it by optical means, almost as a sculptor models clay. He must add colour, and finally motion to his creation. Motion, the time dimension, demands that he must be a choreographer in space”. Thomas Wilfred The most successful early-20th-century artist of colored light in the United States was undoubtedly Thomas Wilfred (1889-1968). In the 1920s, his "Lumia" compositions were praised by art critics and performed throughout the U.S. After initially embracing a musical analogy to explain Lumia, in the early 1930s he shifted to an analogy based on painting. In pursuit of this new context, Wilfred sought to legitimize Lumia through a relationship with the Museum of Modern Art in New York. His career is emblematic of the difficulties inherent in the creation of art using technology early in the 20th century, years before the postmodern embrace of pluralism. Oskar Fischinger was born on the summer solstice in 1900 in Gelnhausen, Germany. Around 1920 in Frankfurt, he met Dr. Bernhard Diebold at a literary club; seeing Fischinger's abstract scroll sketches, Diebold urged him to take up abstract filmmaking. Oskar was greatly impressed by Walther Ruttmann's Opus I in 1921, at the first public screening of an abstract film. Fischinger soon resigned his engineer's job and moved to Munich to become a full-time filmmaker. By June, 1927 financial difficulties forced Fischinger to leave Munich, so he walked to Berlin where he re-established himself. In 1928, he worked doing rockets and other special effects for Fritz Lang's Frau Im Mond. In 1929 he broke his ankle at the UFA studios and while hospitalized, decided that he must devote himself full-time to abstract filmmaking. He then produced the remarkable series of black-and-white studies tightly synchronized to music. These Studies screened widely in Europe, Japan and America, and came to be in such demand that by 1932 Fischinger had his brother Hans, his wife Elfriede, and three other girls working at Fischinger Studio. Oskar pursued experiments with drawn synthetic sound and collaborated with Bela Gaspar on a three-color film process, GasparColor, which allowed him in 1933 to complete his first color film Kreise. Fischinger's subsequent color films Muratti Marches On and Composition in Blue gained so much critical and popular acclaim that Paramount offered him a contract, and in February 1936 he set sail for Hollywood never to return to Germany. Fischinger found it extremely difficult to work in studio situations, enduring episodes at Paramount (1936), MGM (1937), and Disney (1938-9). His frustration at not being able to produce independent film led him to take up oil painting, and he came under the patronage of Hilla Rebay, curator of the Solomon Guggenheim Foundation, who extended several grants to him during the difficult war years. Unfortunately, they quarreled over the artistic merits of his film Motion Painting No.1 (1947) and he never again received adequate financial support to complete another film. For the last twenty years of his life, Fischinger had to content himself with unfinished projects, with his paintings and with a home light-show instrument, the Lumigraph. After some years of relative ill health, he died on January 31, 1967. László Moholy-Nagy was born July 20, 1895, in Bàcs-Borsod, Hungary. In 1913, he began law studies at the University of Budapest, but interrupted them the following year to serve in the Austro-Hungarian army. While recovering from a wound in 1917, he founded the artists’ group MA with Ludwig Kassak and others in Szeged, Hungary, and started a literary magazine called Jelenkor. After receiving his law degree, Moholy-Nagy moved to Vienna in 1919, where he collaborated on the Ma periodical Horizont. He traveled to Berlin in 1920 and began making “photograms” and Dada [more] collages. During the early 1920s, Moholy-Nagy contributed to several important art periodicals and coedited, with Kassak, Das Buch neuer Künstler, a volume of poetry and essays on art. In 1921, he met El Lissitzky in Germany and traveled to Paris for the first time. His first solo exhibition was organized by Herwarth Walden at the Der Sturm gallery in Berlin in 1922. During this period, Moholy-Nagy was a seminal figure in the development of Constructivism [more]. While teaching at the Bauhaus [more] in Weimar in 1923, he became involved in stage and book design and edited and designed, with Walter Gropius, the Bauhausbücher series published by the school. Moholy-Nagy moved with the Bauhaus to Dessau in 1925 and taught there until 1928, when he returned to Berlin to concentrate on stage design and film. In 1930, he participated in the Internationale Werkbund Ausstellung in Paris. The artist moved to Amsterdam in 1934, the year a major retrospective of his work was held there, at the Stedelijk Museum. In 1935, Moholy-Nagy fled to London from the growing Nazi threat; there, he worked as a designer for various companies and on films and associated with Naum Gabo, Barbara Hepworth, and Henry Moore. In 1937, he was appointed director of the New Bauhaus in Chicago, which failed after less than a year because of financial problems. Moholy-Nagy established his own School of Design in Chicago in 1938 and in 1940 gave his first summer classes in rural Illinois. He joined the American Abstract Artists group in 1941 and in 1944 became a United States citizen. His book Vision in Motion was published in 1947, after his death on November 24, 1946, in Chicago. It was August 1976 at the Beacon Theater in New York. A white-haired man dressed in white stepped gingerly out of the wings to take a bow. The audience, which filled little more than half the vast orchestra section, rose in tribute to Alwin Nikolais, whose Dance Theatre's 25th anniversary season had just completed its final performance and who has been called "perhaps America's least appreciated genius." The modern choreographer, composer, and designer was also called a "magician," a "wizard," "the P.T. Barnum, the Tome Swift, the Yellow Submarine of dance," the father of multimedia," an acknowledged pioneer in the use of lighting, design and imaginative stage props, who in his dances, created a total theatre of shape, sound, motion, color and light and not only inverted the choreography but the electronic music, costumes, and lighting design as well." He was also known, to those who know him, as "Nik." He created dozens of visual masterpieces that influenced generations of choreographers. His work was acknowledged with a National Medal of Arts, presented by former president Regan during a White House ceremony in 1987; a Samuel H. Scripps American Dance Festival Award, 1985; a decoration as a Knight of the Legion of Honor, France, 1984; a Capazio Award for Career Excellence, 1982; a Circulo de Criticos Award, Chile, 1973; and in 1968, Emmy and Dance magazine awards. Of Russian ancestry, Nikolais was the youngest of six and studied piano along with his siblings. He was good enough, in fact, to play piano and organ when he was 16 at the neighboring Westport Movie House during the showing of silent films, an apprenticeship which developed his sensitivity to gesture and mood and refined his ability to improvise as an accompaniment to human action. With the advent of "talking pictures" in 1929, Nikolais lost his job and returned to Southington, where he accompanied dance classes and played at roadside inns. He also gave piano lessons and began studying acting privately. In 1933, he attended a performance by German dancer Mary Wigman at New Haven's Schubert Theater. "Spellbound," consequently he went to her former student Truda Kaschmann to study percussion, but she persuaded him that he ought to learn dancing as well. While taking dance classes, Nikolais worked as director of the Hartford Parks Marionette Theatre, a post he held from 1935-1937. He later recalled: "I learned a lot from those puppets. They are all motion and no nerves. I found out that art is motion, not emotion." In 1937, he founded his own dance company and school in Hartford, where he choreographed, danced, and taught. In 1940, he received his first commission as a choreographer--along with his first modern dance teacher, Truda Kaschmann--to create a ballet. Two years later, Nikolais was inducted into the Army and sent overseas. Following World War II, he relocated in New York City where he studied with Hanya Holm, eventually becoming her assistant. In 1948, he was appointed Director of Henry Street Playhouse and formed the Playhouse Dance Company, later known as the Nikolais Dance Theatre. Utilizing his war experiences in his dance, he began to develop his own world of abstract dance theatre portraying man as part of a total environment, placing his work in another realm which was previously untouched by choreographers. It was at this time that he defined dance as "the art of motion which left on its own merits becomes the message as well as the medium." His total dance theatre had begun to take shape and form. Among his best known early works are Tensile Involvement (1953) and Kaleidoscope (1956). The latter was hailed as "evidence of a new force in the modern dance world." In 1956, the Company was invited to its first of many appearances at the American Dance Festival, where it established itself in the forefront of contemporary dance in the United States. Nikolais' impact on dance grew internationally with the Company's 1968 Paris season, which was followed by performances throughout the world. In 1978, the French National Ministry of Culture invited Nikolais to form the Centre Nationals de Dance Contemporaire in Angers, France, and in December 1980, he created his 99th choreographic work, Scheme, for the Paris Opera. At the same time, his choreography for an opera by Gian Carlo Menotti was being staged at the Vienna Staatsoper. The French critics' appraisal of Nikolais as "the most original exponent of American contemporary dance," was echoed throughout Europe and on subsequent tours to South America and the Far East. Included in his long list of celebrated repertory is Allegory (1959), Totem (1960), Imago (1963), Sanctum (1964), Tent (1968), Crossfade (1974), Gallery (1978), Mechanical Organ (1982), Graph (1984), Illusive Visions (1985) and Velocities (1986). In 1987, Nik and Murray, a documentary film by Christain Blackwood, aired on American Master. Over the course of his career, Alwin Nikolais blended his many talents into a single aesthetic force and continued to challenge himself while creating dances, proving the verity of one critic's statement: "No one interested in the arts of the theater can afford to ignore Mr. Nikolais, who combines the roles of poet and showman in a strangely meaningful way." popular culture. At the 1993 Venice Biennial, where he represented Germany, Paik’s installation “Electronic Super Highway” received the prize for best pavillion. Another recent monumental work, “Megatron,” a video wall of more than 200 monitors, was shown in 1997 at the Guggenheim Museum-Soho in New York. Design is for living. That maxim shaped a widespread shift in design during the 1940s and 1950s. It was a revolution of form, an exciting visual language that signaled a new age and a fresh start -- and two of its prime movers were Charles and Ray Eames. The Eamses were a husband and wife team whose unique synergy led to a whole new look in furniture. Lean and modern. Sleek, sophisticated and simple. Beautifully functional. The Eameses adventurously pursued new ideas and forms with a sense of "serious fun." Yet, it was rigorous discipline that allowed them to achieve perfection of form and mastery over materials. As Charles noted about the molded plywood chair, "Yes, it was a flash of inspiration," he said, "a kind of 30-year flash." Combining imagination and thought, art and science, Charles and Ray Eames created some of the most influential expressions of 20th century design--furniture that remains stylish, fresh and functional today. Pioneer computer animator John Whitney Sr. in 1959, operating one of the first computer-graphics engines, a mechanical analog computer built largely from surplus World War II anti-aircraft guidance hardware. The camera is in the upper left, aiming down through the apparatus that "paints" the film with light. Photo by Charles Eames. Computers were originally developed as part of the British and American World War II defense efforts. They were first known as "Turing Machines" after Alan Turing who invented them to break Nazi codes -- the film of Andrew Hodges' biography was recently broadcast as Breaking the Code with Derek Jacobi portraying the inventor. The young John Whitney worked in the Lockheed Aircraft Factory during the war and while he was working with high-speed missile photography, he was technically adept enough to realize that the targeting elements in such weapons as bomb sites and anti-aircraft guns calculated trajectories and produced finely-controlled linear numerical equivalents, which could potentially be used for plotting graphics or guiding movements in peacetime artistic endeavors. A decade would pass before he was able to buy some of these analog computer mechanisms as "war-surplus" and construct with them his own "cam machine," which pioneered the concept of "motion control." In the meantime, Whitney had made about two dozen films in more or less traditional animation. Among these were: in 8mm, a time-lapse of an eclipse and several drawn Variations, in 16mm two Film Exercises accompanied by electronic music composed by Whitney with a system of pendulums he had invented, and about 10 abstract musical visualizations using an oil-wipe instrument he had also invented as well as three 35mm cartoons for the UPA studios. He also did various commercial assignments including the title design for Hitchcock's feature Vertigo (in association with Saul Bass), and the preparation (in association with Charles Eames) of a seven-screen presentation for the Buckminster Fuller Dome in Moscow. James Turrell studied optics and perceptual psychology in college, but he gravitated towards art as his curiosity led him to investigate light itself. His thinking and work are compelling to scientists, artists, and laypeople because his understanding of light comes from a personal process of investigation, resulting in works of astounding beauty. James Turrell was born in Los Angeles in 1943. His undergraduate studies at Pomona College focused on psychology and mathematics; only later, in graduate school, did he pursue art. He received an MFA in art from the Claremont Graduate School in Claremont, California. Turrell’s work involves explorations in light and space that speak to viewers without words, impacting the eye, body, and mind with the force of a spiritual awakening. “I want to create an atmosphere that can be consciously plumbed with seeing,” says the artist, “like the wordless thought that comes from looking in a fire.” Informed by his studies in perceptual psychology and optical illusions, Turrell’s work allows us to see ourselves “seeing.” Whether harnessing the light at sunset or transforming the glow of a television set into a fluctuating portal, Turrell’s art places viewers in a realm of pure experience. Situated near the Grand Canyon and Arizona’s Painted Desert is Roden Crater, an extinct volcano the artist has been transforming into a celestial observatory for the past thirty years. Working with cosmological phenomena that have interested man since the dawn of civilization and have prompted responses such as Stonehenge and the Mayan calendar, Turrell’s crater brings the heavens down to earth, linking the actions of people with the movements of planets and distant galaxies. His fascination with the phenomena of light is ultimately connected to a very personal, inward search for mankind’s place in the universe. Influenced by his Quaker faith, which he characterizes as having a “straightforward, strict presentation of the sublime,” Turrell’s art prompts greater self-awareness through a similar discipline of silent contemplation, patience, and meditation. His ethereal installations enlist the common properties of light to communicate feelings of transcendence and the Divine. The recipient of several prestigious awards such as Guggenheim and MacArthur Fellowships, Turrell lives in Arizona. Krzysztof Wodiczko was born in 1943 in Warsaw, Poland, and lives and works in New York and Cambridge, Massachusetts. Since 1980, he has created more than seventy large-scale slide and video projections of politically-charged images on architectural façades and monuments worldwide. By appropriating public buildings and monuments as backdrops for projections, Wodiczko focuses attention on ways in which architecture and monuments reflect collective memory and history. In 1996 he added sound and motion to the projections and began to collaborate with communities around chosen projection sites, giving voice to the concerns of heretofore marginalized and silent citizens who live in the monuments’ shadows. Projecting images of community members’ hands, faces, or entire bodies onto architectural façades, and combining those images with voiced testimonies, Wodiczko disrupts our traditional understanding of the functions of public space and architecture. He challenges the silent, stark monumentality of buildings, activating them in an examination of notions of human rights, democracy, and truths about the violence, alienation, and inhumanity that underlie countless aspects of social interaction in present-day society. Wodiczko has also developed ‘instruments’ to facilitate survival, communication, and healing, for homeless people and immigrants. These therapeutic devices, which Wodiczko envisions as technological prosthetics or tools for empowering and extending human abilities, address physical disability as well as economic hardship, emotional trauma, and psychological distress. Wodiczko heads the Interrogative Design Group and is Director of the Center for Art, Culture, and Technology, formerly known as the Center for Advanced Visual Studies, at the Massachusetts Institute of Technology. His work has appeared in many international exhibitions, including the São Paulo Bienale (1965, 1967, 1985); Documenta (1977, 1987); the Venice Biennale (1986, 2000); and the Whitney Biennial (2000). Wodiczko received the 1999 Hiroshima Art Prize for his contribution as an artist to world peace, and the 2004 College Art Association Award for Distinguished Body of Work. Robert Irwin has been one of the pivotal artists in American Art for more than 30 years both as a practitioner and a theoretician. Irwin began his career as an abstract expressionist; however, by the late 1960's he had moved away from painting to become one of the creators of the art of light and space, using ephemeral materials such as scrim, lighting and orientation to alter and heighten the viewers perception of the space in which they encountered his work. Since the early 80's Irwin has won an international reputation for his "site-generated" work in public spaces which often make intimate use of natural elements, plantings and topographic features. Robert Irwin was born in 1928 and grew up in Los Angeles, where he attended Dorsey High School. He received his art education at Otis Art Institute, Jepsons Art Institute and Chouinards Art Institute (1948-1954). Later, Mr. Irwin taught at Chouinards (1957-58), University of California, Los Angeles (1962), and in 1968-69, he developed the graduate program at the University of California, Irvine. Beginning in 1970 (with the end of his practice as a studio artist), Irwin's method of teaching became exclusively in response, developing a peripatetic form of accepting invitations to lecture or participate in seminars and symposia in the art, architecture, philosophy and perceptual psychology departments of over 150 universities in 46 states. Along the way Robert Irwin has been the John J. Hill professor at the University of Minnesota (1981); the J. Paul Getty lecturer at the University of Southern California (1986); the Cullinan professor at Rice University (1987-88); the Andrew Ritchie lecturer at Yale University (1988); and the Yaseen lecturer at The Metropolitan Museum of Art, New York (1990). In the early years following art school (1958-68) Irwin practiced as a painter, a period marked by a series of radical reductions in the "highly stylized learned logic of pictorial reality." Today these paintings are in the permanent collections of The Museum of Contemporary Art, Los Angeles; the Whitney Museum of American Art, New York; The Art Institute of Chicago; and the Centre Georges Pompidou, Paris. In 1970 Irwin broke with painting and embarked on an extended inquiry of an art outside the traditional frame and object; working by invitation in existing spaces, Irwin created a series of ephemeral interventions now referred to as the distinctly west coast art of light and space. These works were created in such places as the Museum of Modern Art, New York; The Walker Art Center, Minneapolis; and The Pace Gallery, New York. A facet of this work continues to be present with more recent installations (1994-95) at the Musée d' Art Moderne de la Ville, Paris; Kölinscher Kunstverein, Cologne; and the Museo Nacional Centro de Arte Reina Sofía, Madrid. Since the 1980's Irwin's continued questioning for the "pure subject of art" has carried him to an inquiry of the actual role of art in the light of a radical "modern" art history. This exploration has resulted in "real" world "site-generated-conditional art" proposals and projects in public places such as the Old Post Office Atrium, Washington, D.C.; Stuart Collection, University of California, San Diego; a case study Arts Enrichment Master Plan; Miami International Airport; and his most recent project, the Central Gardens of the new J. Paul Getty Center, Los Angeles. Among the writings and books Mr. Irwin has published are: Rober Irwin Notes towards A model (Whitney Museum of American Art, 1977); Being and Circumstance: Notes Toward a Conditional Art (Lapis Press, San Francisco, 1985); The Hidden Structures of Art (The Museum of Contemporary Art, Los Angeles, Rozzoli International Publications, New York, 1993). A biography Seeing is Forgetting the Name of the Thing One Sees By Lawrence Weschler was published by the University of California Press in 1982. Robert Irwin has received the John Simon Guggenheim Fellowship, a National Endowment for the Arts Grant, and the John D. and Catherine T. MacArthur Fellowship Award along the way. Jean Rosenthal is considered one of the pioneers of theatrical lighting design. She emerged as a specialist at a time when a show's lighting was usually handled by either the scene designer or the master electrician. It was during her thirty three year career that the Lighting Designer joined the Scene and Costume Designer as a member of the production team. Eugenia (Jean) Rosenthal was born in New York City on March 16, 1912. She was the daughter of Drs. Pauline (a psychiatrist) and Maurice (an ear, nose and throat specialist) Rosenthal and attended Manumit School in Pawling, NY and the Friends Seminary in Manhattan. After briefly studying acting and dance at the Neighborhood Playhouse during the 1929-1930 academic year, she became a technical assistant to Martha Graham, a member of the school's dance faculty. This was the beginning of a life long association with Martha Graham and her dance company. Between 1936 and her death in 1969, she designed the lighting for fifty three dances in the company's repertory. She returned to the Neighborhood Playhouse as a lecturer and production advisor during the 1937-38 and 1940-41 seasons. In the late 1950s, Miss Rosenthal began developing plans for a book on lighting design. She would dictate the material when she had time. It would be edited and shaped by writer: Lael Wertenbaker, and illustrated by her assistant, Marion Kinsella. During the early 60's Jean was constantly in demand, so little work was done on the book. In 1968 she was diagonosed with cancer. During her long stays in the hospital she was finally able to dictate the essential material that would become the basis for her final legacy. The Magic of Light, which has long been out-of-print, was published in 1972. Cook studied at the College of Arts and Crafts, Birmingham from 1949-54. He taught in secondary schools and then at Coventry College of Art from 1961-9. He was Head of the Fine Art Department at Stourbridge College of Art from 1969-74; senior fellow in fine art, painting, at Cardiff College of Art from 1974-9; Gregynog Fellow, University of Wales 1977-8 and then Head of Fine Art at Birmingham Polytechnic from 1979-83. He was Artist-in-Residence at Fishgard Arts Festival in 1984 and at the National Museum and Art Gallery, Cardiff where he had his studio base. In 1992 he moved to Cornwall. Born in London 19 March 1930, Sedgeley studied building and architecture at Brixton Technical School, London 1944-46. He had no formal art education but was influenced professionally by Bridget Riley, Harry Thubron and Bruce Lacey. After completing his National Service in the R.A.O.C. in Egypt 1948-50 he married Marguerite Wiltshire, 1951 and they had two children. He was an Architectural Assistant at R Ward & Partners, London 1946-48, Gollins Melvin, London 1953-54, Clifford Culpin, London 1955-56 and Architects Co-Partners London 1956-59. Sedgley was an Aircraftsman in the the 2nd Class Royal Air Force in Wiltshire, Somerset and Oxfordshire in 1960. Initiated buildings technicians co-operative 1957-58 and Arts information Registry (A.I.R.) and Space Provision Artists Cultural and Educational (S.P.A.C.E.) 1968. Sedgley was a professional architect before turning to painting in the early 1960s. He began to explore Op art effects in large paintings of soft-edged concentric circles which appear to pulsate with light and colour. He favoured the circle for its 'anonymity' which allows the sensation of colour rather than the form to command attention. He made use of contemporary materials, making his own black paint from commercial pigments and resins which were applied with a Devilbliss spray gun. He used masking out to apply the successive layers of colour corresponding to the chromatic scale of the spectrum with white as a neutral spacer. The effect is hypnotic and changes with the movement of the viewer. VIDEO: "Setting a Good Corner"
VIDEO: "Read/Reap" & "Hanging Carousel (George Skins a Fox)"
VIDEO: "Mapping the Studio (Fat Chance John Cage)"
Born in 1941 in Fort Wayne, Indiana, Bruce Nauman has been recognized since the early 1970s as one of the most innovative and provocative of America’s contemporary artists. Nauman finds inspiration in the activities, speech, and materials of everyday life. Confronted with “What to do?” in his studio soon after graduating from the University of Wisconsin, Madison, in 1964 with a BFA, and then the University of California, Davis in 1966 with an MFA, Nauman had the simple but profound realization that “If I was an artist and I was in the studio, then whatever I was doing in the studio must be art. At this point art became more of an activity and less of a product.” Working in the diverse mediums of sculpture, video, film, printmaking, performance, and installation, Nauman concentrates less on the development of a characteristic style and more on the way in which a process or activity can transform or become a work of art. A survey of his diverse output demonstrates the alternately political, prosaic, spiritual, and crass methods by which Nauman examines life in all its gory details, mapping the human arc between life and death. The text from an early neon work proclaims: “The true artist helps the world by revealing mystic truths.” Whether or not we—or even Nauman—agree with this statement, the underlying subtext of the piece emphasizes the way in which the audience, artist, and culture at large are involved in the resonance a work of art will ultimately have. Nauman lives in New Mexico. Scenic and Environmental Art' is the name of a person . That name is Kenny Greenberg, or as he is also called mister Krypton. "What is scenic neon and how does it differ from typical neon work?" range of steps that must be taken to assure that the work performs safely and reliable . Often both the installation or 'load-in' of the neon, and the neon's actual operation throughout the course of a show, will be occurring under more than normally stressful conditions ." "What are some examples of your work?" prominent work is in the revival of 'Grease!' where the entire stage is a montage of pop art-like images from the fifties . Other well known shows include `Miss Saigon', `Five Guys Named Moe', the Who's 'Tommy', and 'Victor/ Victoria' . Was born 1934 in Basel (CH); 1956-59 studies at the Akademie für angewandte Kunst in Vienna (A). With Günter Brus participant of the Viennes Actionist group and elaboration of the American «action painting.» Moves to New York (1962–1986). Since 1970 teaching and 1985 Fellow of the John Simon Guggenheim Memorial Foundation. 1986–1990 visiting professor at the Hochschule für Angewandte Kunst in Vienna. Lives in Vienna. Davies has dealt with the themes of nature, psyche, and perception in her work for more than 25 years. She studied liberal arts (visual art, philosophy, religion, anthropology and biology) at Bennington College, Vermont from 1973 to 1975, and obtained a Bachelor of Fine Arts degree from the University of Victoria, British Columbia, in 1978. Over the following decade, she worked with many different media, including painting, documentary filmmaking and animation, developing a distinctive symbolic language and aesthetic. In the mid 1980s, Davies began to explore the virtual space of 3-D computer technology as a means of furthering her artistic intentions: in late 1987, she became a founding director of Softimage, building it into the world's leading developer of 3-D animation software, used for special effects in many Hollywood films including «Jurassic Park» and «The Matrix.» Davies was on the Softimage Board of Directors and head of its Visual Research group for a ten-year period, during which the company went public on Nasdaq in 1992 and was acquired by Microsoft in 1994. She left Softimage at the end of 1997 to found her own art & technology research company, Immersence Inc.; lives and works in Montréal and San Francisco. Bridget Riley was born in 1931 at Norwood, London, the daughter of a businessman. Her childhood was spent in Cornwall and Lincolnshire. She studied at Goldsmiths College from 1949 to 1952, and at the Royal College of Art from 1952 to 1955. Riley has exhibited widely since her first solo show in 1962. Among numerous exhibitions, she was included in the 1968 Venice Biennial where she won the International Prize for painting. Riley began painting figure subjects in a semi-impressionist manner, then changed to the Neo-Impressionist technique of Pointillism around 1958, mainly producing landscapes. The same year she was deeply impressed by the large Jackson Pollock exhibition at the Whitechapel Art Gallery in London. In 1960, working initially in black and white, she evolved a style in which she explored the dynamic effects of optical phenomena. These so-called 'Op-art' pieces, such as "Fall", 1963, produce a disorienting physical effect on the eye. Riley taught children for two years before joining the Loughborough School of Art, where she initiated a basic design course in 1959. She then taught at Hornsey School of Art, and from 1962 at Croydon School of Art. She worked for the J. Walter Thompson Group advertising agency from 1960, but gave up teaching and advertising agency work in 1963-4. "In my earlier paintings, I wanted the space between the picture plane and the spectator to be active. It was in that space, paradoxically, the painting 'took place,'" Bridget Riley summarized with characteristic incisive clarity. "Then, little by little, and, to some extent deliberately, I made it go the other way, opening up an interior space, as it were, so that there was a layered, shallow depth. It is important that the painting can be inhabited, so that the mind's eye, or the eye's mind, can move about it credibly." Heather Ackroyd and Dan Harvey have collaborated since 1990. "After observing the pale outline created by a ladder left on a lawn for a few days, the duo decided to make sod into a photographic medium." Heather Ackroyd's has worked in sculpture, visual and performance art. Multidisciplinary work with focus on processes of growth and transformation, striving to articulate a relationship between performance and visual art. Dan Harvey has worked primarily in sculpture since 1980 and often uses found objects where the effects of nature can be seen. He places these within "intimate tableaux of implied narratives to do with transience, alchemy and decay. " Slate is a principle material in much of his work. The scale moves from very small intimate pieces to large landscape designs. Their collaborative work includes installation, sculpture, landscape design, photography, performance, film and frequently reflects both architectural and scientific concerns. Another conceptual focus is time and visibility. "In the greater body of our artwork we play with many materials exploring processes of growth, transformation and decay, and we embrace the transience and ephemeral nature of our materials. Yet somehow the fragility of these chlorophyll apparitions urged us to make moves to preserve them longer." "We can't recall the precise moment when we first articulated this desire to hold the image - conceptually, we can rationalize the move to preserve the photographic grass image for longer by saying it follows through the established process of photography of exposing, developing and then fixing the image." "To talk about 'fixing' an image refers directly to the photographic process of stabilising the emergent picture. It is a word used as much now, as nearly 200 years ago, by the early pioneers of photography such as, Thomas Wedgewood, Humphrey Davy, Fox Talbot, the Niepce brothers, Daguerre, and Bayard, to name but a few. " Vortex Lighting was founded in 1996 by Anne Militello, the principal lighting designer of this group, located in Hollywood, CA. Lighting designs produced in our studios encompass architectural projects, theater and concert lighting, major theme park attractions and lighting art installations. b. 1933, Jamaica, N.Y.; d. 1996, Riverhead, N.Y.
Daniel Flavin was born in Jamaica, New York, on April 1, 1933. He studied for the priesthood for a time. During military service in 1954–55, Flavin studied art through the University of Maryland Extension Program in Korea. Upon his return to New York in 1956, he briefly attended the Hans Hofmann School of Fine Arts and studied art history at the New School for Social Research. In 1959, he took drawing and painting classes at Columbia University; this year, he began to make assemblages and collages in addition to painting. Flavin’s early paintings reflect the influence of Abstract Expressionism. His first solo show of constructions and watercolors was held at the Judson Gallery, New York, in 1961. In the summer of 1961, while working as a guard at the American Museum of Natural History, New York, Flavin started to make sketches for sculptures in which electric lights were incorporated. Late in that year, he made his first light sculptures; he called these “icons.” In 1963, he began to work with colored fluorescent tubes. His sculpture was shown in a solo exhibition, some light, at the Kaymar Gallery, New York, in 1964. In 1967, Flavin was a guest instructor of design at the University of North Carolina in Greensboro. By 1968, he had developed his sculpture into room-size environments of light; this year, he outlined an entire gallery in ultraviolet light at Documenta in Kassel. A retrospective of Flavin’s work was organized by the National Gallery of Canada, Ottawa, in 1969; the exhibition traveled to the Jewish Museum in New York in 1970. Among Flavin’s numerous exhibitions in Europe were solo shows in Cologne in 1974 and Basel in 1975. He has executed many commissions, including the lighting of several tracks at Grand Central Station in New York in 1976. Bob Miller first started taking friends outside the Exploratorium to show them his discoveries about images and sunlight in the summer of 1975. At the time, he was building the exhibit Holes In A Wall and was fascinated with the way single images of the sun that shone through pinholes could combine in so many unexpected ways. It wasn't long before Bob became convinced that all light is in the form of images. He set out to show this in a whole series of exhibit sculptures that include Image Mosaic, Christmas Tree Balls, Sophisticated Shadows and many others. Over the years, Bob's Image Walk has evolved into an Exploratorium institution. It has been nourished continually by the comments and questions of visitors, interns, Explainers and Exploratorium staff. An Image Walk can last an hour, or a day. It always begins outside the museum with a single image of the sun, and it ends inside with exhibits on images and shadows. It can lead almost anywhere. Bob Miller has created many of the best-loved exhibits on light and color, including the Sun Painting. N55, a four-person artist collective based in Copenhagen, has been engaged for nearly a decade in research on the design and production of an ecologically self-sufficient environment. At the New Museum, they will exhibit Public Things, a module constructed from durable and weather proof polyethylene tanks that includes a kitchen, wash basin, shower, toilet, bed, table, and chair. Visitors will be able to manipulate Public Things to their liking. n55 transformed solar energy into social energy, and invited the public for socializing or contemplation. Jim Campbell was born in Chicago in 1956 and lives in San Francisco. He received degrees in Mathematics and Engineering from MIT in 1978.
him a leading figure in the use of computer technology as an art form. Excerpt from the essay "Jim Campbell: Working in the Open Sphere"
who grew up not only on television, but on Nintendo and the Internet. in its ideas, its conceptual concision, and its apparent simplicity. (born 1954),  is an installation artist who has worked extensively with machines and media. His career has included stints with Laurie Anderson and the USC Interactive Media Division. He has taught at the Cooper Union School of Art, the San Francisco Art Institute, and the graduate Computer Art Department in the school of Visual Arts in New York. He is currently an Associate Research Professor in the Interactive Media Division at the University of Southern California School of Cinema-Television, as well as a visiting artist at the California Institute of the Arts. His work is included in the exhibition "Open House: Working In Brooklyn", currently on view at the Brooklyn Museum. was born in 1956 in Lima, Ohio. She trained in textile design at the University of Kansas, and later received an MFA from Yale University. While her degree is in sculpture, textiles and fabric have continued to be an important part of her work, which includes installations, photographs, videos, performances, and objects. For example, following graduation she made “Toothpick Suit,” for which she layered thousands of toothpicks in porcupine fashion along a suit of clothes that she then wore and photographed. Hamilton’s sensual installations often combine evocative soundtracks with cloth, filmed footage, organic material, and objects such as tables. She is as interested in verbal and written language as she is in the visual, and sees the two as related and interchangeable. In recent work, she has experimented with exchanging one sense organ for another—the mouth and fingers, for example, become like an eye with the addition of miniature pinhole cameras. In 1993, she won a prestigious MacArthur Fellowship. As the 1999 American representative at the Venice Biennale, she addressed topics of slavery and oppression in American society with an installation that used walls embossed with Braille. The embossed Braille caught a dazzling red powder as it slid down from above, literally making language visible. After teaching at the University of California at Santa Barbara from 1985 to 1991, she returned to Ohio, where she lives and works. Cai Guo-Qiang was born in 1957 in Quanzhou City, Fujian Province, China. He was trained in stage design at the Shanghai Drama Institute from 1981 to 1985. Cai's work is scholarly and often politically charged. Cai initially began working with gunpowder to foster spontaneity and confront the suppressive, controlled artistic tradition and social climate in China. While living in Japan from 1986 to 1995, Cai explored the properties of gunpowder in his drawings, an inquiry that eventually led to his experimentation with explosives on a massive scale and the development of his signature "explosion events," artistically choreographed shows incorporating fireworks and other pyrotechnics. Cai Guo-Qiang's practice draws on a wide variety of symbols, narratives, traditions and materials such as fengshui, Chinese medicine, dragons, roller coasters, computers, vending machines, wildlife, portraiture, non-Han Chinese citizens and their cultures, fireworks and gunpowder. Much of his work draws on Maoist/Socialist concepts for content, especially his gunpowder drawings which strongly reflect Mao Zedong's tenet "destroy nothing, create nothing." Bill Viola (b.1951) is considered a pioneer in the medium of video art and is internationally recognized as one of today’s leading artists. He has been instrumental in the establishment of video as a vital form of contemporary art, and in so doing has helped to greatly expand its scope in terms of technology, content, and historical reach. For over 35 years he has created videotapes, architectural video installations, sound environments, electronic music performances, flat panel video pieces, and works for television broadcast. Viola’s video installations—total environments that envelop the viewer in image and sound—employ state-of-the-art technologies and are distinguished by their precision and direct simplicity. They are shown in museums and galleries worldwide and are found in many distinguished collections. His single channel videotapes have been widely broadcast and presented cinematically, while his writings have been extensively published, and translated for international readers. Viola uses video to explore the phenomena of sense perception as an avenue to self-knowledge. His works focus on universal human experiences—birth, death, the unfolding of consciousness—and have roots in both Eastern and Western art as well as spiritual traditions, including Zen Buddhism, Islamic Sufism, and Christian mysticism. Using the inner language of subjective thoughts and collective memories, his videos communicate to a wide audience, allowing viewers to experience the work directly, and in their own personal way. Wolfgang Laib finds spirituality in the simplicity of everyday, organic substances—milk, pollen, beeswax, rice—that provide sustenance or engender life. In 1975 he created his first Milkstone in what has become an ongoing series of elemental sculptures. A rectangular block of polished white marble containing a slight depression on its upper surface, the piece is filled with a thin layer of milk to foster the illusion of a solid form. Though an inert object, this sculpture requires ritualistic participation. Laib performs the first act of pouring the milk when the piece is displayed, but after this initial gesture, the collector or museum staff must clean and refill the stone each day it is on view. Ritual plays a central role in all of Laib's highly reductive art. He lives in a remote region of Germany's Black Forest, communing with the natural world outside his house as a painter would work in his or her studio. During the spring and summer months he collects pollen, including dandelion, hazelnut, pine, buttercup, and moss varieties, from the fields surrounding his home. He displays this laboriously gathered material in simple glass jars or sifts it through sheets of muslin directly onto the floor to create large, square fields of spectacular color. He also molds the brilliantly pigmented dust into cones, as in The Five Mountains Not to Climb On. Though intimate in scale and intensely fragile, this hazelnut pollen sculpture alludes to the monumentality suggested by its title. The notion that there is infinitude in the infinitesimal is beautifully manifest in Laib's spare but highly aesthetic practice. An MFA graduate of Art Center College of Design in Pasadena, Won Ju Lim currently lives and works in Los Angeles as a sculptor and installation artist. Taschen’s Art Now: 137 Artists at the Rise of the New Millennium finds that Lim’s work “focuses on the tensions between perception, space, and subjectivity in the post-modern age. In order to reflect on and represent the shifting relationship between these three elements, she usually takes architectural reconstructions whose ‘realism’ she questions, critically and poetically, through the judicious use of light, slide projection and video installation.” Lim is represented by Patrick Painter, Inc. in Los Angeles and has had solo exhibitions in Madrid, Salamanca, London, Berlin, Siegen, Basel and Vancouver. Shirin Neshat seeks to, according an article in Time, "untangle the ideology of Islam through her art." Her current cinematic work continues to express the poetic, philosophical, and metaphorical as well as complex levels of intellectual abstraction. Thater received her undergraduate degree from NYU in Art History and her MFA from Art Center College of Design. Since her first solo show in 1991, she has exhibited widely throughout North America and Europe, with one-person exhibitions at Dia Center for the Arts (2001), the Vienna Secession (2000), The Museum of Modern Art (1998), the MAK Center for Art and Architecture Los Angeles (1998), the Walker Art Center (1997), the Kunsthalle Basel (1996), Salzburger Kunstverein (1996), The Renaissance Society (1995), and the Witte de With Center for Contemporary Art (1994), among many others. In March 2004 the Museum für Gegenwartskunst Siegen and the Kunsthalle Bremen in Germany opened a simultaneous two-museum survey exhibition of her work from 1993 to 2003. Her numerous group exhibitions include the Whitney Biennial (2006, 1997, 1995) and the Carnegie International (1999). She was the recipient of the Phelan Award in Film and Video in 2006 and was awarded a Guggenheim Fellowship (2005),  an Etant-donnes Foundation Grant (1996), and an NEA Fellowship (1993). Since 2000, Thater has been the artist-in-residence for The Dolphin Project, a non-profit organization that protects cetaceans from slaughter, captivity, and abuse. Her work is held in many public collections including the The Guggenheim,  the Tate, the Whitney Museum of American Art, The Art Institute of Chicago, the Museum of Contemporary Art, Los Angeles,and the Walker Art Center. Thater’s work explores the temporal qualities of video, while literally expanding it into space. She is best known for her site-specific installations in which she manipulates architectural space through forced interaction with projected images and tinted light, such as knots + surfaces (2001). Thater’s primary interest lies in exploring the relationship between humans and the natural world and the distinctions between untouched and manipulated nature. She has focused her lens on a wide variety of animals including zebras, tigers, bees, dolphins, wolves, horses, and most recently birds of prey for her exhibition at David Zwirner, New York. Though she is a devoted activist for the environment and wildlife, Thater’s work is not meant to arouse sympathy or empathy, but instead to propose observation as a mode of understanding. The installations follow ideas in 20th Century art whose great innovation was the intense exploration of abstraction in painting and sculpture. Despite nods to structural film, Thater's underlying reference points are closer to panoramic landscape painting. Thater’s stated belief is that film and video are not by definition narrative media, and that abstraction can, and does exist in representational moving images. (born 1953) is an English photographer known for his landscapes. Kenna attended Upholland College in Lancashire, the Banbury School of Art in Oxfordshire, and the London College of Printing. In the 1980s, Kenna moved to San Francisco and worked as Ruth Bernhard's printer. Kenna's photography focuses on unusual landscapes with ethereal light achieved by photographing at dawn or at night with exposures of up to 10 hours. His work has been shown in galleries and museum exhibitions in Asia, Australia, Europe and the United States. He also has photographs included in the collections of the National Gallery of Art in Washington, D.C., the Patrimoine photographique in Paris, the Museum of Decorative Arts in Prague, and the Victoria and Albert Museum in London. In 2000, the Ministry of Culture in France made Kenna a Chevalier in the Order of Arts and Letters. In 2006, Kenna wrote the preface to Humans, a photo-series by Iranian photographer Mohammadreza Mirzaei . From 1989 until 1995 Eliasson studied at the Royal Danish Academy of Art. Later, he spent an extended period in Williamsburg, Brooklyn, working as a studio assistant for Christian Eckhart. His work is represented in many private and public collections, including the Guggenheim Museum in New York and the Los Angeles Museum of Contemporary Art. He currently lives and works in the German capital, Berlin. It was recently announced that he will be involved in a project with luxury goods company Louis Vuitton. According to LV website: "A new project by the internationally renowned artist Olafur Eliasson, Eye See You, will be presented at Louis Vuitton Fifth Avenue, the company's New York flagship, on Thursday 9th November 2006. All fees from the project will be donated to 121Ethiopia.org, a charitable foundation recently established by Olafur Eliasson and his wife. The San Francisco Museum of Modern Art (SFMOMA) is organized Eliasson's first full-scale survey in the United States Take Your Time: Olafur Eliasson, which was on view from September 8, 2007 to February 24, 2008. It was Eliasson’s first major U.S. survey exhibition. It spanned the artist’s diverse range of artistic production between 1993 and the present, the exhibition included site-specific installation, large-scale immersive environments, freestanding sculpture, photography, and special commissions seen through a succession of interconnected rooms and corridors, including the the museum’s skylight bridge which is turned into an installation titled One-way Colour Tunnel. Curated by Madeleine Grynsztejn, Elise S. Haas Senior Curator of Painting and Sculpture at SFMOMA and incoming director of the Museum of Contemporary Art, Chicago, in close collaboration with the artist, the major survey unified nearly 15 years of Eliasson’s career and will embark on a national tour following its San Francisco debut, accompanied by an extensive catalogue, the first American publication to fully assess the critical context of Eliasson’s practice. Cardiff's installations and walking pieces are often audio-based. She has been included in exhibitions such as: Present Tense, Nine Artists in the Nineties, San Francisco Museum of Modern Art, NowHere, Louisiana Museum, Denmark, The Museum as Muse, Museum of Modern Art, the Carnegie International '99/00, the Tate Modern Opening Exhibition as well as a project commissioned by Artangel in London. This project ("The Missing Voice (Case Study B)") was commissioned in 1999 and continues to run. It is an audio tour that leaves from the Whitechapel Library, next to the Whitechapel tube stop and snakes its way through London's East End, weaving fictional narrative with descriptions about the actual landscape. Cardiff represented Canada at the São Paulo Art Biennial in 1998, and at the 6th Istanbul Biennial in 1999 with her partner George Bures Miller. A recent mid-career retrospective, Janet Cardiff: A Survey of Works, Including Collaborations with George Bures Miller, opened at P.S. 1 Contemporary Art Center, Long Island City, Queens, in 2001 and has travelled to Montréal, Oslo, and Turin. Exhibitions in 2006 include Good Vibrations–Le arti visive e il Rock, Palazzo delle Papesse, Centro Arte Contemporanea, Siena, Anticipation, The Museum of Contemporary Photography, Chicago and Sonic Presence, Bergen Kunsthall, Bergen, Norway. In 2005, the Hirshhorn Museum and Sculpture Garden of the Smithsonian Institution commissioned and exhibited Cardiff's work "Words Drawn in Water". in order to explore ideas about architectural space, motion, and perception. His work was significant in the development of cardiology, physical instrumentation, aviation, cinematography and the science of labor photography. He is widely considered to be a pioneer of photography and an influential pioneer of the history of cinema. We live in a time in which all material frontiers are being explored, and the interest in new materials now extends beyond the fields of design and architecture into popular culture. With the recent explosion in the quantity of new materials and products, it is important to highlight the candidates which will most likely influence our physical world. We cannot touch or hold it, but we can see it, and with it, see our world. Light defines our physical, visual and mental experiences. It determines how we move and stirs our emotions. At the Hudson River Museum (New York), the exhibition The Magic of Light examine light art as physical sensation. Magic presents work by 14 artists who changed the nature of art by using light rather than paint or stone to create. Their artworks move away from the traditional art object and focus, instead, on the viewer©ˆs perceptions. The Magic of Light displays the work of both established and emerging American artists. James Turrell, part of the Light-and-Space movement of the 1960s and 1970s along with Robert Irwin, works with pure light, while his main goal is the viewer©ˆs highest visual and physiological perception. Magic also shows how the vocabulary of these seminal artists is reexamined by the recent work of artists like Susan Chorpenning. The entire museum is the framework for this exhibition. Five new installations by Stephen Antonakos, Pietro Costa, Kenny Greenberg, Erwin Redl and Robert Thurmer were created especially for The Magic of Light. Cole, KC. for The Exploratorium. Looking at the Light. Washington, D.C.: Association of Science-Technology Centers, 1981. In a light-hearted style, this publication describes the seventeen exhibits in the Exploratorium's Looking at the Light show. The descripdons and supplementary text discuss light and shadows, pinhole images, refraction, and reflecdon. An indespensible book covering many area with very good illustrations. One of our favorites! * Pirenne, M.H. Optics, Painting, and Photography. Cambridge, England: Cambridge University Press, 1970. Pirenne provides an exhaustive discussion of images and optics, recommended for the dedicated reader. * Shull, Jim. The Hole Thing. New York: Morgan & Morgan, Inc., 1974. You can capture the image that is revealed by a small hole on film by using a pinhole camera. Shull describes in detail how to construct and use a pinhole camera. * Time-Life Books. The Camera; Life Library of Photography. New York: Time-Life Books, 1976. This book about cameras and photography includes a section which contrasts the pinhole with the lens as a way of controlling light and explains the camera obscura in its historical context. Profusely illustrated with photos and sketches. * Time-Life Books. Light and Film; Life Library of Photography. New York: TimeLife Books, 1976. This richly illustrated treatise on the role of light and film in photography in cludes a section discussing the nature of light, with graphic representations of the electromagnetic spectrum, the effects of the Earth's atmosphere on sunlight, scattering of sunlight, reflection and refraction. * Williamson, SJ. and Cummins, H. Light and Color in Nature and Art. New York: John Wiley and Sons, 1983. An encyclopedic treatment of the role and behavior of light. This is a great thought on the myth and the man that are Santa Claus. My friend Al told me he was struggling with telling his four-year-old daughter about Santa Claus. “It’s the only lie I’ve ever told her,” he said. I too have a four-year-old daughter and am currently in the thick of Santa Fever at my house, where we’ve been lauding Père Noël for the last three Christmases. He’s a legend I’m honored to propagate. I study legends for a living. Monsters, ghosts, extraterrestrials, and ancient mysteries swirl around me like smoke from a smoldering campfire. If there’s one thing that’s certain: it’s that all legends have a solid foundation in someone’s reality. From there the story grows and evolves; it becomes part of a collective human experience. Legends are real. The point can’t be argued. When I say “Bigfoot,” an image is instantly conjured in your mind. You no doubt picture a tall, hairy, upright-walking creature who lurks in the forest. There are Halloween costumes that feature this biped, he even shills beef jerky in TV commercials. Can there be any doubt as to the veracity of this legend? Whether there is an actual ape-like creature wandering the forests of the world can be debated forever. But the legend itself cannot. The only reason that $20 bill in your pocket is worth more than the $1 bill is belief. Faith. We believe our government will back up these bank notes so they’re worth something. If we collectively lose that belief, our monetary system will collapse. Before there was the hoopla, the guy in the red suit at the mall, the shopping frenzy, the Christmas trees, and the holiday lights, there was a man—a regular man who was the foundation of something extraordinary. Nicholas lived in the land of Myra (which is modern-day Turkey) around 300 A.D. He was the only child of a wealthy family and was orphaned at a young age. The boy grew up in a monastery and entered priesthood by age 17. A true philanthropist, and inspired by a person named Jesus who lived long ago, Nicholas gave away his wealth throughout his life. He left gifts for children in their shoes, he was known to toss small sacks of gold through open windows, and to lavish affection upon the poor. The Catholic Church canonized him shortly after his death, making him St. Nicholas. A real person inspired Catholics to make him into a saint. When the Church established Christmas on December 25th to coincide near the Pagan holiday of Yule, incorporating Nicholas and his spirit of generosity into the Christmas season was a natural fit for the Church. The legend of that saint grew, evolved, and spread through a natural folklore process. Over the centuries, Nicholas’s story was passed around, he was copy-catted by others who took joy in giving away money and toys to poor children. As the centuries passed, his legend grew to mythic proportions and took on supernatural attributes. In 1860 a Harper’s magazine illustrator named Thomas Nast depicted Santa as a big round man who had a workshop at the North Pole and a list of all the good and bad children. 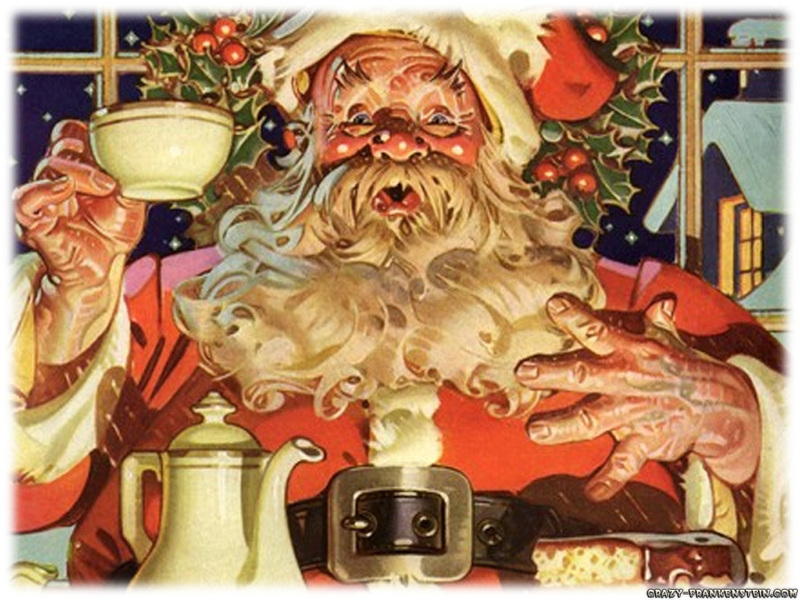 In 1931 the Coca Cola Company made the figure of Santa in a red suit with white fur trim a cultural icon as part of their advertising campaign. The first time a child meets Santa Claus, it’s like meeting the world’s biggest celebrity. Most of us never forget the racing heartbeats, the giddy excitement, or maybe even the fear of meeting this omniscient, supernatural being who can either make your dreams come true by laying your most desired toy under the Christmas tree, or crush you with lumps of coal and sticks in your stocking. As we get older, our ideas of Santa morph and evolve until many of us actually become Father Christmas—either at the office holiday party or when we have children of our own. The Santa experience offers genuine miracles on both sides of the fluffy white beard in a world where most mysteries are dying off at an alarming rate. Since Santa went mainstream in the nineteenth century, he’s has been deified, lampooned, imitated, commercialized, scorned, and overexposed. But through all the murk and mess, Santa’s magic still shines through like Rudolph’s nose through the fiercest blizzard. We created Santa. All of us. Each Christmas he’s born again. We teach our own children about Santa because, even if only for the first few years, it’s right to believe in magic. From the children’s perspective, it’s so wonderfully simple: On December 24th, before they go to bed they leave milk and cookies out for Santa. They glance at the empty space under the Christmas tree, and run off to try and sleep; giddy with anticipation. The next morning there is tangible evidence of the supernatural visitation: The cookies are mostly eaten, the milk is mostly drunk, and behold the wrapped presents under the tree! I don’t care if you’re Christian or not. I’m a paranormal guy. I believe in possession. In Judaism there’s the concept of the “Dybbuk,” which is a type of spirit possession. This possession can be a bad thing: like if you’re inclined to drink too much or do drugs, a spirit that did that in life may cling to you and push you over the edge; or it can be a good thing: you’re trying to get healthy and exercise and a spirit who did that in life may be drawn to you to help. We get possessed by good ideas, gut instincts, and inspiration all of the time. We also get inspired by great legends… like Santa Claus. Santa’s legend and story has spread throughout the world. Each Christmas we get inspired… nay, possessed by this good spirit. I’m thrilled my daughter is eagerly awaiting St. Nick visiting our house. I want her to know the magic this figure holds. By carrying on these traditions which were based on a real man, I become a part of the legend. I write myself into the story. I write my daughter into the story in the hopes that one day she too will become possessed by the spirit of Christmas. That she will be reminded to behave because someone is out there watching, that she will feel the urge to give to charities a little more, that she will know there’s still magic in the world. Believe in Santa, Al. His legend is real. He’s real. He’s you. He’s me. He’s a bit of all of us. And next year he’ll be back, because we’ll never stop needing him. This is a manual for analogue Sound Restoration.